We were delighted to welcome Chef Philip Chronopoulos from the Palais Royal restaurant to give a cuisine demonstration to Le Cordon Bleu Paris students. Chef Chronopoulos’s culinary career has been crowned with success. 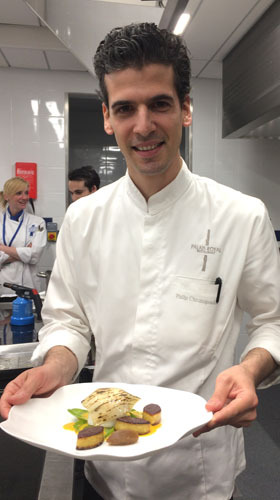 Following a training programme at the Paul Bocuse school, in Lyon, Philip Chronopoulos was involved in opening L’Atelier de Joël Robuchon in London. He then joined Alain Passard at the Arpège restaurant. In order to broaden his experience, he returned to Joël Robuchon and launched his international career. Chef Chronopoulos’s creations show considerable expertise and a desire to please with cuisine which is of a generous nature, made using quality seasonal ingredients. Chef Chronopoulos makes dishes in which flavours and textures overlap, reflecting authentic French cuisine with a breath of fresh air.